Math mats are like task cards but without the cutting! You can even skip the laminating by just slipping a math mat into a page protector. You can literally purchase this product, print it and have it in use in your classroom immediately. Each card has four tasks that the students will complete using the number or numbers inside the middle circle on the mat. A customized answer sheet makes it easy for students to record their answers. The 8 mats included will provide you with 32 math tasks. Math mats are perfect for centers, small groups, scoot games, write the room, independent practice formative assessment, and enrichment or remediation depending on your grade level. 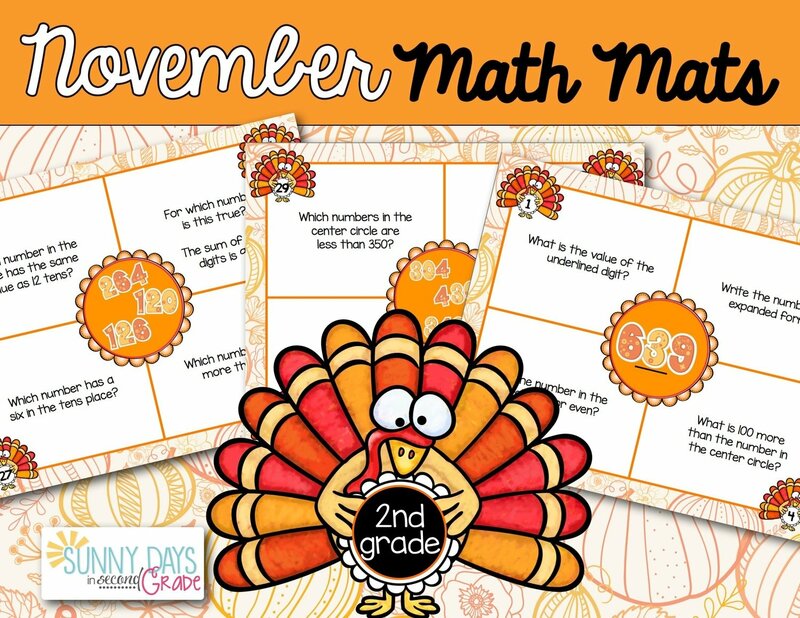 This set of math mats has a fun fall color scheme and a cute Thanksgiving turkey for a seasonal flair. The math skills covered in this set include only those that are routinely covered by this point in the year: number sense, place value, forms of numbers, and basic operations.